Giving your customers more options to pay for your products is a great way to improve sales, build loyalty and enhance the shopping experience. Now, you can securely and easily untangle yourself from land line-based point-of-sale equipment and accept payments anywhere business takes you. Your customers will appreciate the added convenience, and you’ll enjoy increased sales. Pivotal Payments can provide you with short-range wireless solutions for restaurants, bars and indoor retail environments. We also have cellular-connected payment terminals for taxi, delivery and other long-range payment needs. Need a little something extra, or don’t process that many transactions? PivotalMOBILE is our swiper and app that works with smartphones and tablets, including your iPhone, iPad, BlackBerry or Android device. It’s an affordable add-on that brings mobile convenience to any business. Plus, it’s so easy to use—just plug it in, swipe the card and you’re done! All of our mobile payment solutions are PCI compliant and offer end-to-end encryption for optimum security. And with round-the-clock client care, you’re always just one call away from friendly, knowledgeable support. To choose your perfect wireless solution, click here to get in touch or call us at 1-877-462-7486. Whether you want the freedom and flexibility to accept electronic payments curbside, at the table or anywhere in your store, the iWL252 provides your customers the convenience of paying right where services are received. With secure, reliable Bluetooth connectivity, the iWL252 incorporates the most advanced features and functions and the most intuitive user interface on the market today. 4096 colours – 2.81 in. Accept electronic payments quickly, easily and securely, no matter where you are, with the latest 3G cellular technology. 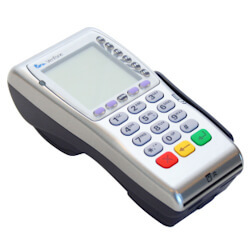 The Ingenico iWL255 terminal is the perfect solution for businesses with people on the go, such as taxi drivers, street vendors, home repair technicians, and delivery patrons. 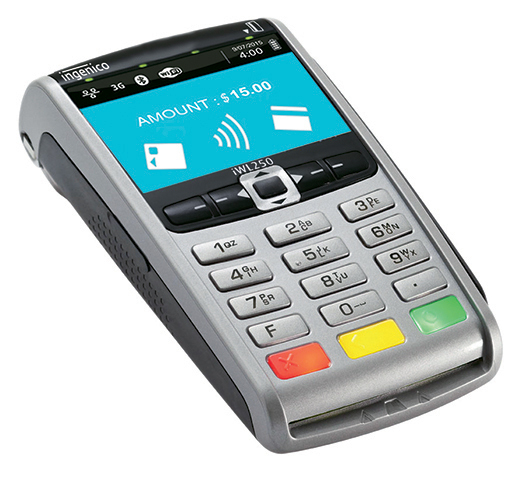 The iWL255 is an innovative, high-performance solution for accepting mobile payments anywhere, any time. Go places with Verifone’s VX 680. Specifically tailored to the needs of merchants on the move, this full-function, portable payment device is power packed with performance. Businesses from delivery services and stadium vendors to restaurants will benefit from wireless connection options, lightningfast processing speeds and the reliability and security of the proven VX platform. Never miss a sale! PivotalMOBILE is a mobile payment solution that gives you access to anytime, anywhere credit card processing with your smartphone or tablet. The device fits in the palm of your hand and works with an easy-to-use app for iOS, Android and BlackBerry devices. PivotalMOBILE’s best-in-class credit card reader plugs directly into the audio port of your smartphone or tablet. Simply plug in, swipe and get paid.